Any suggestions on repairing the 6 gallon aluminum water heater tank? I have what looks to be a very small hole in mine that may or may not be from corrosion or pitting. I'm eventually going to replace either the tank or the whole heater. Just want to patch it for now til I can get some cash together and do it right. It's a 16' 1981 Sunline 16 RD. Not sure what that actually means but it's a great little camper. No leaks, pretty solid, and everything works (except the tank, of course). Planning on trying my luck with JB Waterweld as my first line of attack. Any suggestions? Amy I wasting my time? Any comments welcome. JB weld is good stuff but usually what happens to them is pin holes in the bottom of the tank from all the crud that's left in there after it's drained why the drain is not on the bottom is beyond me. I believe they are aluminum plated steel so once the holes start it never ends. The tanks are only like $30 or so less then a new heater and a bit more of a pain to replace. I'm sure it will probably only be a temporary patch but I'm thinking it will buy me at least a little time. IMHO, bypass the leaker for now and replace. how long has it been a leaker? as mainah stated , the drain is not in the bottom, but the pin holes ARE ! spend the time fixin the floor under the heater, like I had to on our 81 1950. WASA, I know where the hole is and where the drain is. If they were reversed I would be a much happier man. LOL. It hasnt been leaking. It just started. So the floor is fine. Its not been used for a while and was bone dry when I got it. While we are on the subject, any way to bypass the water heater itself and just "rough it" with cold water? At least til I get the tank replaced? This^ just get a winterizing kit and bypass the entire tank once you get every thing fixed it makes winterizing a lot easier. There is a little device you can hook to your hose to wash the tank out don't know if it works or not leaves a lot of questions seems like all it would do is stir every thing up. Me I would not mind pulling a plug on the bottom of the tank even if I had to lay on the ground. Put the JB on yesterday. I don't think it's going to work. Tomorrow I perform a water heaterectomy. I'll just bypass it til I can afford a replacement next month probably. Anyone know about the gas line? Am I going to need to cap it or something in order to use the gas while the heater unit is gone? They do make a cap for the gas flare fitting a good hardware store should have them. Anyone know about the gas line? Am I going to need to cap it or something in order to use the gas while the heater unit is gone? I'm assuming yours has copper flares. 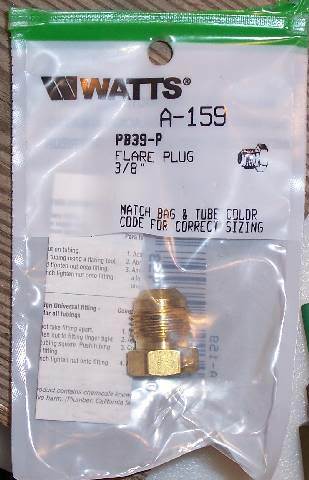 If so go looking for this flared plug. Lowes had it. If you plug off the line and ever want to use the gas valve in the future as a spare etc. use electrical tape over the gas valve fitting to keep the dirt out. Dirt will kill that valve. Thanks for all the help. I think I'm going to leave the heater in til I decide to replace it. In the meantime tried a different patch that I think may work. I'll know for sure Monday. If not, I have a lead on some cheap tanks that might make it worth my while to replace the tank rather than the whole unit. Just need to figure out the model of the heater. I'll keep you posted. Safest bet is to bypass it or replace - but you could try a self tapping screw with some sealant on the threads. Thats pretty much what I did. I dont know what model water heater I have, though. The water heater itself seems to work fine and removal/replacement of the tank looks pretty straight forward (for me, anyway). The problem is that there are a gajillion different 6 gallon tank configurations and I dont know the model of the Atwood heater I have. the info inside the compartment is worn away. Its an 81 16 RD if that makes any difference. Mine is a 21RB 1982. I am on vacation and won't be home for another two weeks but if someone doesn't help you out with a model number suggestion I will let you know what my model number is when I get home. 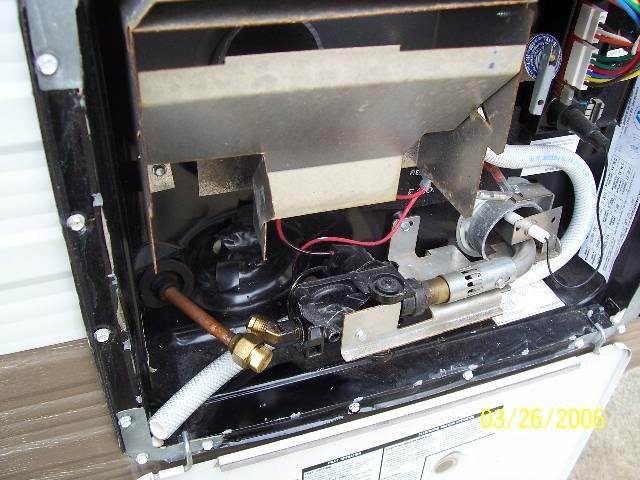 Your 1981 16 Rear Dinette might sport the same heater... I guess you don't have any owners literature in the camper relating to the water tank.